Congratulations, you built an iOS app. It’s a great feeling, but now comes the hard part. Getting people to download it. There are many different mobile marketing strategies you can use, but the first step is implementing App Store Optimization (ASO). App Store Optimization refers to the continual two step process of using techniques to increase the visibility of your app in the App Store and then convincing potential users to download it. NOTE: This post focuses on the iTunes App Store. 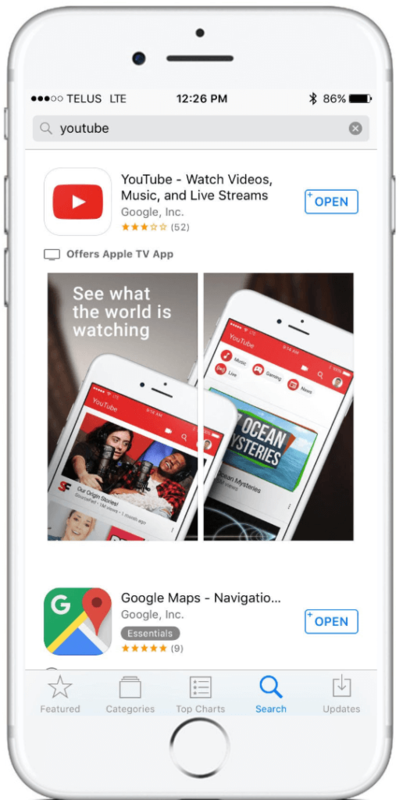 Why is App Store Optimization so important? According to Forrester, 63% of users find apps by searching the App Store. That’s almost two-thirds of your potential users. If you don’t use App Store Optimization techniques, people might not find your app. Also, even if they find your app and your page doesn’t entice the user to download, you have a problem. Looking at Featured Apps: When you first open the iTunes App Store you will be taken to the “Today” tab. Apple features certain apps and displays them prominently so that users can easily find them. App features are curated by a team at Apple who ensure the best apps are spotlighted. The app features are updated on a weekly basis. Browsing by App Categories: Users can go to either the Games tab or the Apps tab and select “All Categories” to navigate between categories. NOTE: Apple has decided to separate Apps from Games in iOS 11 to give both categories some breathing space. Browsing by App Rankings: Users can find the rankings selection in two different ways. They can either go to the Games or Apps tab and scroll down until they see the rankings section or they can find the app rankings through the categories section stated above. Searching for an App: The last tab in the store will allow users to manually search for apps by typing words or phrases. There is also a trending list which shows popular search terms. Before you learn how to use App Store Optimization to increase visibility for your app, you should understand how the App Store works. When you submit your app to the App Store you must first enter information into the system so the store knows how to display your app properly. You will input information like the App Title, App Categories, Keywords, App Icon, App Screenshots, and App Description. This information is used to create your app page. The App Store then uses an algorithm which combines the basic information you inputted with other factors to rank your app by popularity. Only Apple knows exactly which criteria is in their algorithm and what ingredients are weighted higher than others. However, we do have a good understanding of how we can use App Store Optimization to impact the algorithm positively. 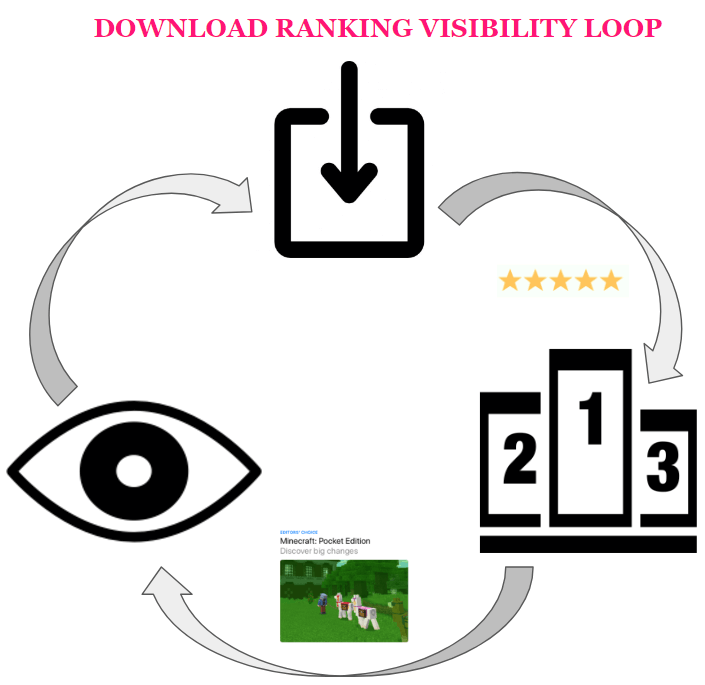 When your app goes live, the algorithm starts to work and feeds the App Store through a Download Ranking Visibility Loop. The more downloads you receive the higher the app ranking. The higher the app ranking the higher the visibility. Also, with more downloads comes more ratings/reviews and the higher the ratings and reviews the more likely you are to be featured. If your app is featured, this will, in turn, increase visibility/downloads which will start the cycle over again. Implementing App Store Optimization allows you to influence the Download Ranking Visibility Loop, which will then impact the App Store algorithm increasing your visibility and downloads. Below are different factors that will impact your App Store Optimization. App Store Optimization starts with a great app. If you didn’t create a great app then you shouldn’t waste your time reading further because nothing I am about to tell you will help. So, What Makes a Great App? Understanding Need: It is important to understand the problem your app is going to fix. You do this by doing market research to study the problem and possible competitors. Only then will you find the market fit. If you create a great app that has a great fit, the users will come. Targeting the Right Audience: Who are you trying to target with your app? How will this app help them? Knowing your audience will allow you to create a great app. Great Design – Is your App designed so that it is easy to understand and use? If it is hard to figure out people will delete it and you will lose them. The best apps are simple in design and simple to use. Apps as a Service – The best apps are not products, they are services. App developers who constantly refine their apps and frequently update the app with new content will create a better app experience. Bug-Free: Apps that are bug-free will cause less crashes and a better experience for the user. This will also influence App Store Optimization because a bug-free app will generate better Ratings & Reviews and ultimately more downloads. The iTunes App Store allows you to pick one category and two subcategories for your app. Do not slack off. Picking the right App Categories is important. Although this is crucial, don’t worry if you don’t like your categories later; you can always go back and change them. The categories you choose will determine where the app will be ranked. Your goal is to pick categories that make sense for your app to be in but also have the least amount of competition. Understand the Categories: Look at all the different App Categories to determine where your app might fit. Also, keep up to date with new App Categories that might appear. If a new category works for your app and you can get in early enough, you will have less competition for rankings which will affect your ASO positively. Do Research: Use metrics like Pocketgamer Store Metrics to understand how much competition is in each category. The less competition the higher your ranking. Experiment: If you aren’t achieving a high ranking in one category, switch it up. Remember the higher the ranking, the more visibility, and the higher the downloads. NOTE: You can only change categories in the iTunes App Store when you are submitting a new update to the app. Your app title is one of the most important factors for App Store Optimization. When you create an app you need to understand why a potential user would download your app. Understanding the user’s search intent could influence the title you choose. It is also important to pick an app title that is unique and stands out. Word of mouth often leads to people searching the App Store to find the app their friends told them about. If you don’t have a memorable name, potential users might forget what they are looking for before they even search. Branded words are the most searched terms in the App Store. Understand Context & Intent: You must understand why someone would search for your type of app. Make sure your title communicates how you can solve the problem they were searching for. Keep it Under 25 Characters: If your title is longer than 25 characters, the letters will wrap or get cut off. This doesn’t look very good. Keep it under 25 characters to make it more appealing to potential users. Use Keywords in the Title: Make sure that you use at least one keyword in your title. This will give you more visibility when people type in the keyword into the search engine. Incipia found that using a keyword in the title ranked 2x better than the same keyword in the keyword field. Don’t Keyword Stuff the Title: Apple has cracked down on this practice as of iOS 10. Keyword stuffing is the practice of taking popular search terms and stuffing them into your title. Your app won’t pass review if you name it: Angry Flappy Starbucks Bird. 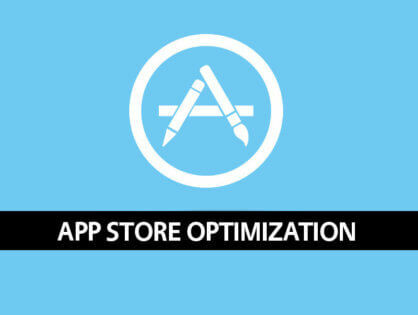 Next to the App Title using the right keywords is the most important factor to achieving great App Store Optimization. The iTunes App Store allows developers to input keywords when they submit the app. These keywords are invisible to the user, but Apple uses them for its search function. Developers can input words up to 100 characters. It is very important to pick the right keywords and try to use the maximum character limit. Do Research: Use tools like App Annie, Sensor Tower, Tune or Mobile Action to do research. Make sure you use more than one tool. All tools work differently so don’t put all your eggs in one basket. You need to use the tools to track your direct and indirect competitors to see what keywords they are using. You will then be able to see which keywords have less competition and can also boost your rankings. Other important tools would be Google Trends and Google Keywords. Although these tools are mainly used for SEO, they will help give guidance about what people may be searching for when looking your type of app. Employ Long Tail Strategy: When choosing keywords please note that higher rankings on less popular keywords are more useful than lower rankings on popular keywords. 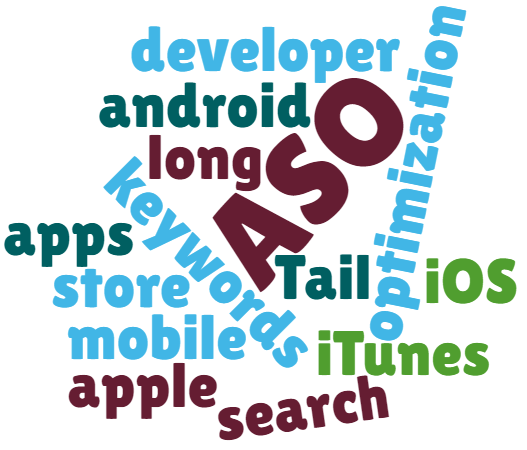 You need to find less popular keywords in order to boost your App Store Optimization. Maximize Character Limit: Maximize the character limit. When you type your keywords, spaces don’t count, so don’t waste characters on spaces. Use commas to separate keywords. Don’t Duplicate Keywords: There is no point in using the same keyword twice. This also goes for your app title. Don’t repeat the same words in your title and keywords. You are just wasting valuable characters. Don’t Pluralize: Save yourself some characters and don’t pluralize. Entering “card” and “cards” gives you the same keyword. Numbers Work: If it makes sense to use numbers for your keywords type the numbers, don’t write them out. If you think someone will search for your app by using numbers then use them. Forget ‘Stop’ Words: As in SEO, using ‘stop’ words for keywords is a waste because they don’t count. Although there is no such thing as a complete ‘stop’ words list. This is a good start. Localize: As I stated above, you only get 100 characters for keywords. However, if you localize your App, you will get an extra 100 characters per language to enter more keywords. There is no rule that the keywords have to be in the new language. Some words are universal, so if you need more space; localize. Leverage Apple Search Ads: Apple Search Ads allows you to bid on specific keywords. The more money you bid on a keyword the higher your app will show up when a user searches for that keyword. When you search for keywords to bid on, Apple Search will show you how popular those keywords are. You can use this tool to improve your ASO by researching which non-popular keywords will increase your ranking and downloads. Understand Short Term vs. Long Term Keywords: You can only change your keywords every time you update your app. Almost every time you update your app you should change some of your keywords. Switch out keywords that aren’t working for you and replace them with better ones. It is important to understand which keywords you want to keep long term and which keywords are easily replaceable. A great app icon is the equivalent of a great headshot. It’s the first impression and you need to make it great. The app icon is also the face of your product on the mobile device itself. If a user downloads your app and doesn’t feel compelled to click on your icon and use it, there is no point to get them to download it in the first place. Use a Simple Design: Do not over complicate the design of your app icon. The best app icons use a simple but memorable design. Use Flat Design: Apple has designed iOS with a flat design and although it isn’t 100% necessary, using a flat design for your app icon makes your app look like it was built with the iOS platform in mind. This means the app icon will look great next to other apps on your device that were designed in the same style. Also, you increase your chances of a feature if you adhere to Apple’s design guidelines. Mock Up Your Designs: When you create different icons, evaluate them against other app icons in the store. Try to answer whether your app icon blends in or stands out. A/B Test: Test your icons in different settings to see the impact towards potential users. Always keep testing because even when you are sure you have the right icon, things will change. Match Your Icon to Your App: Your icon should match your app. Sounds simple enough but there has to be a consistency in your brand in order for it to become memorable to users and get downloads. Switch it Up: Everytime you update your app is an opportunity to change the icon. Sometimes it makes sense to change the icon a little bit as a retargeting tool in order to attract users that have already downloaded your app but haven’t come back in a while. 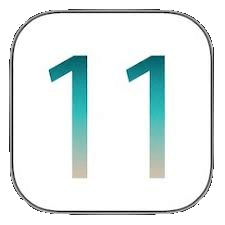 Many apps will change their icon slightly to time with a special promotion happening around an event like Halloween or Christmas. Your App Rating & Reviews is another significant piece of App Store Optimization. The higher the star rating and higher the volume of reviews the better. Your goal should be to get as many positive reviews as possible. Users are more likely to download your app if you have a lot of positive reviews. 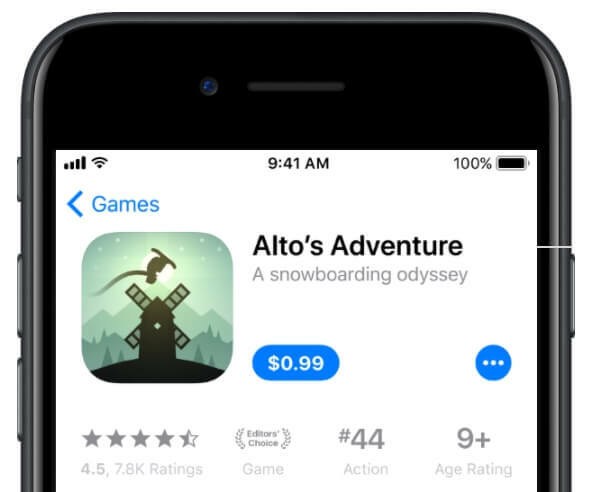 Ratings & Reviews not only play an important role in App Store Optimization but the App Store curators won’t even consider your app for a feature on the App Store if your app isn’t rated at least 4 stars. Use Rate Me Prompts: Many people only rate apps when they have a negative experience. In order to get more positive reviews, you should message the users at a point in their experience that doesn’t interrupt. Also, give them time to use your app, it doesn’t make sense to prompt a user to rate your app if they have only been using it for five minutes. You should ask them (don’t beg) to rate the app directly after they have had a positive experience in your app in order to increase your odds of a positive review. Respond to Ratings: Whether you have received a positive or negative review, respond to the user. Sometimes a little customer support is enough to change a 3-star review to a 4-star review. Make It Easy to Contact You: If your users are having a negative experience it is better for them to contact you directly then to give you a low star rating on a public review. Make sure it is clear how they can contact customer support. Often times you will be able to fix their issue and turn an almost negative review into a positive one. Run a Contest: Message your users to rate your app in exchange for entry into a contest. This is a great way to incentivize the review. Buy Reviews: There are a number of third party sites that you can pay to receive positive reviews. Sometimes this is the only way to get the ball rolling. NOTE: Apple frowns on this practice and if you are caught your app may be taken down. App Trailers or Previews were added to the App Store in 2013 and are a maximum of 30 secs in length. 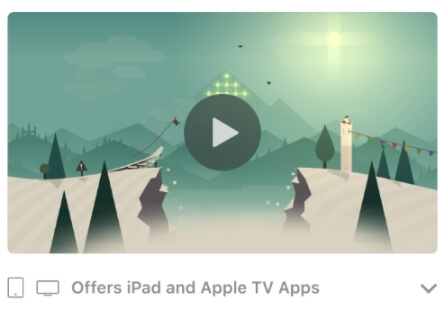 For the first time, app developers were able to add a video trailer of their app to the store. Use the preview video to give a more accurate depiction of your app before a user downloads it by demonstrating features, functionality, and UI. With iOS 11, the App Previews will autoplay by default, although users can manually turn this setting off. You will also be able to add up to 3 App Previews and localize them for all available App Store languages. Plan: It is important to plan your key messages before you start taking footage. It is easy to just screen capture elements of your app but the best video trailers tell a story to the user. Use Text: Most of the time showing imagery works best when creating an App Preview. However, when appropriate, use text overlay to highlight your key messages. Use an End Card: An End Card is a static image that you place at the end of the video. Make sure you have a strong call to action (CTA) to download the app when the video ends. Like the App Preview, use screenshots in the App Store to tell a story. When potential users look at the screenshots you want to convince them to download the app. It is important to showcase your app’s value and important features. Getting the best out your screenshots will affect App Store Optimization favorably. Tell a Story: The best screenshots aren’t just screenshots, they are advertisements of your app. 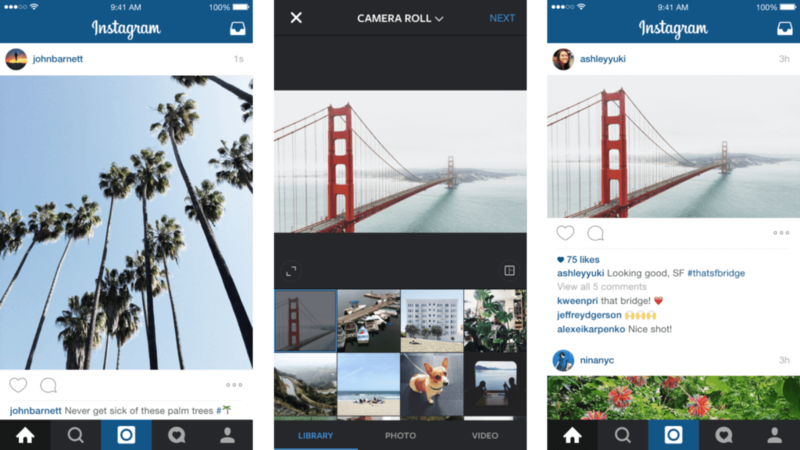 Place your screenshots in a specific order to tell a story and walk people through your app. Make sure that the screenshots are a representation of the app. If you make custom screenshots that do not show the actual UI of your app, Apple could reject you. Maximize the Shots: You get slots for 5 screenshots, make sure you use them all. Also, make sure you create screenshots for all device sizes. If you don’t, users on those devices will be unable to view your screenshots. Update: You can now submit screenshots per device family (iPhone / iPad) and they will be automatically resized. Localize: If you are using text in your screenshot make sure you localize the text and use different screenshots per language. Experiment: Since the screenshots on the store are in portrait you will be able to create screenshots that look like they are connected together. Experiment to create a great experience for your potential users. Your App Store description is more important for Search Engine Optimization (SEO) than for App Store Optimization. This is because the words that you use do not count as search terms in the App Store. 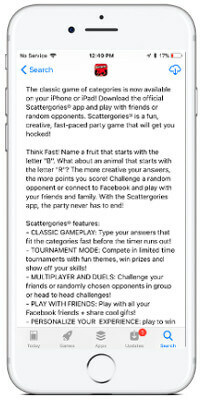 There is no point stuffing your app description full of keywords. However, your App Store will show up in a Google Search so it should still be optimized for SEO. 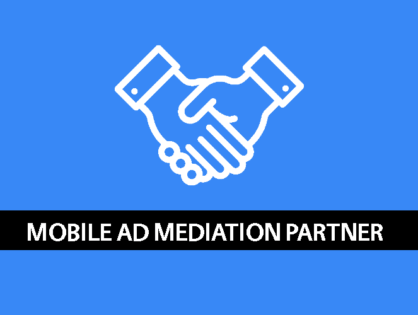 Make a Great First Impression: The goal of the description is to persuade the potential user to download the app. However, most people don’t read the entire description. That’s why it’s really important to pay attention to the first 133 characters without spaces. This is the only text that is visible to the user when they first go to your page. They can click “more” to read the entire description. However, you have 133 characters to convince them to download or keep them intrigued enough to keep reading. Explain Why: Make sure you explain very early on why they should download your app. If there is a problem your app solves, make sure you state the problem and explain why your app is the solution. It might be very obvious to you but your potential users might not understand. Showcase Key Features: Make sure you highlight key features with bullet points to make it easily readable. Don’t Forget a CTA: You should place CTA or Call to Action as early as possible in the description calling on users to download the app. Build for SEO: The App Store Description has nothing to do with App Store Optimization from an App Store search perspective but it is still important for ASO. Users who read your description and are enticed to download will impact your ASO. Also, App Store descriptions can be found on search engines like Google, so you need to make sure your description is Search Engine Optimized. Another crucial factor for App Store Optimization is “App Freshness.” The App Store algorithm likes when apps are updated regularly. Older apps that haven’t been touched in a long time will fall in the rankings. Many popular apps like Facebook update on a weekly basis. Update Frequently: How much is too much is unknown, however, we do know that updating your app frequently will increase ASO. Highlight Changes: When you submit an update to the App Store you must provide “What’s New” text. This is your opportunity to communicate to your user why they should update the app. It is important to highlight new features, new content, or bugs you may have fixed. The actual size of your app is an often overlooked factor in App Store Optimization. If the ultimate goal is to gain more downloads, then you want to make sure your app is under one hundred megabytes. Over one hundred megabytes and Apple requires the user to be connected to wifi to download which is a barrier to entry. They do this to protect the user so they don’t spend their data downloading large apps but could limit your downloads. Use Server Technology: Build your app with only the essential content necessary when a user first downloads the app. Then use server technology to download more content to the app when it is in use. The best apps make sure this action takes place in the background without the users’ knowledge. Compress Images: Some of the biggest files inside of apps are images. In order to save space make sure you run all your image files through loss less compressor in order to shrink the size without sacrificing quality.